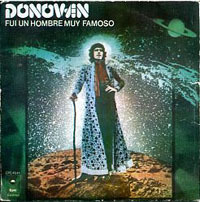 · Donovan: vocals, acoustic guitar and mouth harp. Horn arrangement on track 01. · Phillip Donnelly: rhythm electric guitar on track 01. · Wilton Felder: bass on track 01. · Dave Hungate: bass on track 02. · Bobbye Hall: shakers and conga on 01. · B. J. Coop: vocal back-up on track 01. · Donny Gerrard: vocal back-up on track 01. · Ed Whitting: vocal back-up on track 01. · Africa: vocal back-up on track 01. · Doug Davis: cello and arrangement on track 02. · Tom Scott: recorder and arrangement on 02. Tenor sax on 01. · David Foster: piano, clavinet and horn arrangement on track 01. Piano, arp woodwinds and arrangement on track 02. · Jay Graydon: arp programmed on track 02. · Chuck Findley: slide trumpet and flugel horn on track 01. · Lew McCreary: trombone on track 01. · The cover that appears here is the Spanish version, and so it has the title translated.